Wow! What an adventure. Pakistan certainly proved to be one those far-flung corners of our planet. Clint and I finished up our time in Pakistan with a wild 2 LOOOONG day jeep ride over the high desolate Deosai Plains east of Nanga Parbat. We met up with another American David who was doing a big mountain biking tour with Zafar our guide. Clint wanted to take a side excursion down to India-controlled Kashmir to capture Kargil in a sneak attack, just like Musharraf did back in ’99. I had to talk him out of it citing that would take a little too much time. 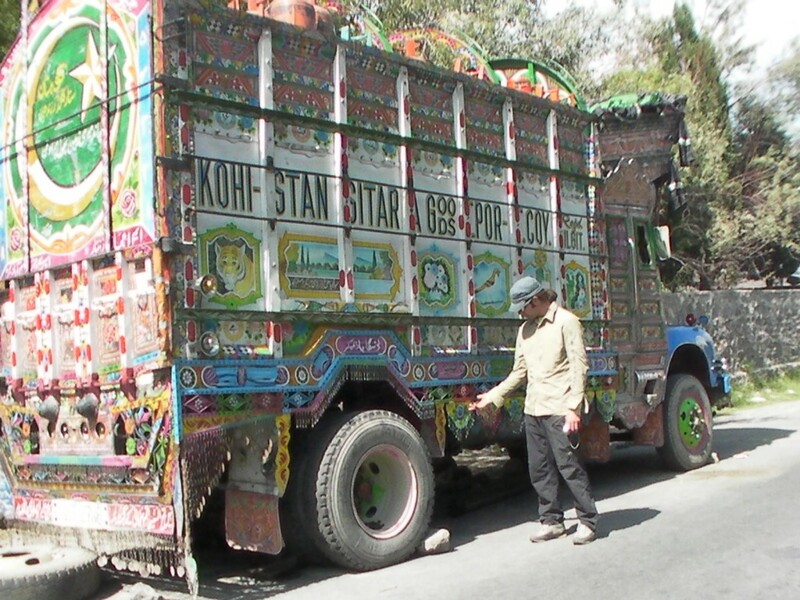 So we continued on down through Astore and met up with the would famous Karakoram Highway. 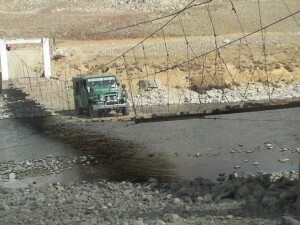 We were originally scheduled to drive down the KKH to Islamabad the following day. After a cursory review of David’s itinerary, we realized that if we immediately hit the road and put the pedal to the medal for 16 hours, David would barely catch his flight out of the country. The KKH is very bumpy, very twisty, and has 178,000 police checkpoints due the to security situation. Our intrepid driver made fine work of this 600 kilometer challenge and we renamed our Jesus Handles “Allah Ak-Bars.” For several hours in the middle of the night, we gave a ride to a traveling police officer so we even had our own bodyguard! We arrived in Islamabad worn-out, but not so tired that we couldn’t do a little partying. While in Kaphlu, Clint and I had met a guy named Ashley who works for the Air Force at the U.S. Embassy. He invited us out to the Canadian Club for wings specials and happy hour. As we hadn’t had a drop of beer in over a month, we were lightweights. Then we were off to the French Club for a late-night dance party. Clint was in his best form as he took a running start across the dance floor, leaped over the Jamaican contingent, and cannonballed into the pool. The security was not pleased. The following day, after a late start, we met Zafar for a great lunch at an Afghani restaurant and met some local Pakistani friends of friends. That night we were off the check out the party at the Marines’ Club on the American compound. While this resembled a wild frat party, I managed to keep Clint out of the pool. Then it we were off directly to the airport. Getting through ticketing, security, and immigration was confusing and nerve-racking. I thought I was going to have to leave Clint at the security checkpoint, where an irate officer pulled pitons out of his bags. Only a true dirtbag climber would put all of his solid metal equipment in his carry-on luggage. I clearly remember Clint frantically jumping up and down trying to demonstrate that, however hard he tried, he cut not cut through his hand with a BD Lost Arrow. I was reminded of those weird wind-up monkey dolls that bang cymbals together; that’s when I knew it was really getting strange. I began having paranoid feelings that they just might not let us out of the country! I blamed it on bad Moosehead beer at the Marines’ Club. Anyhow we narrowly made the plane, literally the last ones on. 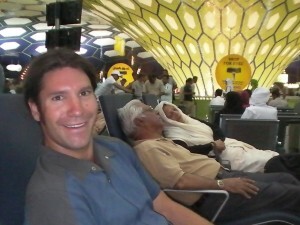 Clint and I went our separate ways at the Abu Dhabi airport; he to Cairo and myself direct to Chicago. As I would soon be in the clear, I wished Clint best of luck, silently thinking that he would definitely need it in order to avoid ending up in some cesspool Egyptian jail. The rest of my journey went by smoothly finishing up with a beautiful drive across the state of Colorado amidst the height of fall colors. My truck rolled up the the house just in time for dinner. Lindsay had prepared an incredible pork roast, most definitely not Halal, and cold IPA was waiting. I am a lackluster Muslim. Yesterday I briefly talked to Clint, through spotty cell service. He had arrived safely home and through some small miracle, even his bag of confiscated pitons had made it back as well. It was a great adventure to visit the wonderful and amazing country of Pakistan. And it was also great to come home! Hello everyone! 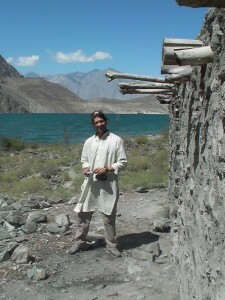 After several weeks of great adventures, Clint and I have made it back to Skardu in northeastern Pakistan. We spent our first week out building emergency shelters in the villages of Hushe and Kande. We found the locals very excited to learn these impromptu building techniques and very willing to lend a hand filling and tossing sandbags. The kids were especially enthusiastic! We completed two shelters and stockpiled materials for one further shelter in the village of Hushe. A local group of concerned citizens works with an American researcher to take winter snow leopard photography. They have hauled the building materials to the “top-side”, the summer yak pastures, and should have the shelter complete in a month, as soon as the demands of harvest are over. After waiting a week, the army officially refused to let us enter the Kondus Valley, even though the Ministry of Tourism had issues us a Special Permit. So we redesigned our climbing adventure and headed up the Nangmah Valley where we knew there was good climbing, but maybe not as much first ascent potential. We had been having a bit of weather and woke up to 1″ of new snow in basecamp our first morning there. Luckily the weather improved and the temps would increase slightly. First we had our sights set on a wild aid line on Green Tower, but the shady north face with it’s cold and fully vegetated cracks turned us away. We set our sights on the sunny south ridge of Denbor Brakk. Over two days we managed to climb about 2000 feet of the south ridgeline to the south tower. Most of the route was wide crack climbing so the giant cams and Big Bros proved essential. The final steep offwidth on the tower headwall was airy and vomit-inducing! 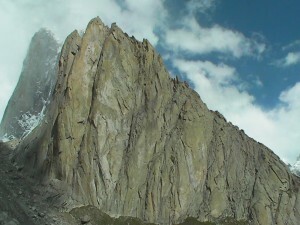 After several rest days we tried the south face of Brakk Zang. What do you know, but more wide cracks! We found bolted belays for several pitches. Then all evidence of prior passage disappeared and we pushed our high point several pitched higher up the face before bailing in a snow storm. We estimate we climbed 1200 ft to only halfway up the face. This will someday be a long climb! Last Sunday, September 7th, Matt’s wife received a phone call from Zafar, Matt and Clint’s guide. The boys were not able to enter the Kondus valley and decided to stay in the Hushe valley to climb and search for new route potential. Zafar said that the two hasty shelters that were built in villages around Hushe were a huge success and they will be used as shelter for the upcoming Ibex hunting season. The villages were extremely appreciative and learned a great deal from the Ouray boys workshop. I do not expect to hear from Matt and Clint for another week so, CLIMB HARD BOYS and have a blast! So, here we are, in Khaplu, for three days now. Just beyond town is the Army checkpoint signalling the beginning of the Closed Zone. It’s 80 km up to Kondus and the Granite Towers of our Dreams. We secured the Special Permit a month ago to allow us into the Kondus Valley. Three days ago we loaded up the trucks and stopped at Zafar’s father’ house on the way out of town. Mohammed Iqbal is a local paliamentarian and is very respected by his constituency. The father and son Iqbal team at Baltistan Tours have been doing a great job. Mohammed called the new local brigade commander for the region concerning our access to the closed zone. The bridage commander’s exact words were “Not even the U.S. Ambassador to Pakistan is coming in here.” So it doesn’t sound good. The Iqbal’s have since spent hours on the phone with the Ministry of Tourism trying to clear up lines of communication in hopes that they will honor our Special Permit, which was authorized by the Army in late June. Today, inshallah, we will be allowed in. Inshallah means ‘God Willing’ and is used in 50% of all complete sentences in Pakistan. The 100% Muslim society here is amazing, from the mandatory prayers 5 times a day to the women covered completely in burkhas. So we have spent the past three days drinking lots of tea, doing some bouldering and scrambing, and enjoying the locals sites. These mountain valleys are amazing, not only for the massive rock and ice peaks towering above, but also for the massive dusty brown valley bottoms that blossom with pockets of rich green hillsides due to thousands of years of ingenious irrigation and terracing. If these Baltis can do one thing, it’s rock stacking. Rockes are stacked into walls, aqueducts, houses, nice square piles, houses on top of walls, walls on top of houses, etc. Yesterday we visited the small village of Thalay Dalter. 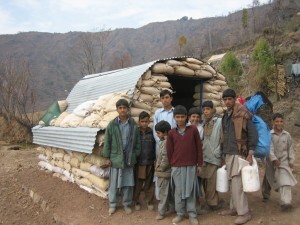 This small village is off the trekking routes and has not seen much aid. Zafar’s friend Ahmed is the president of the village. He and Mohammed Hussein, another education committee member gave us a tour of their small English basis primary education school. It has 90 students (50 girls and 40 boys) grades 1 to 5 in a single small room. The students that can’t fit inside spill out into the adgacent fields. They had all the students line up for us and gave us a tour. The kids were very shy but did their best to give us a little interview. The committee feels that the most important need for Thalay now is a new school building for these students. Clint and I promised to do our best to secure grants for their project. After visiting the school we were treated to a wonderful lunch of homemade bread, butter, yogurt, curried potatoes and peas, and of course tea. We made it into Skardu today. It has been a wild journey already. I rendezvoused with Clint in the Abu Dhabi airport. He arrived there from Egypt minus one bag that Luftansa left in Germany. I came from Denver via a cancelled flight, a different flight, an impromptu bus ride through Queens, then the nicest flight I’ve ever taken on Etihad Airways, complete with jasmine-scented mist pouring out of the ceiling. One more flight put us in Islamabad at 4am, where we first met our great guide Zafar Iqbal Baltistan Adventure Tours. Zafar has been extremely helpful, from getting together materials for the hasty shelter project to getting us through the red tape at the Pakistan Alpine Club and the airport. We sat in Islambad for a day waiting for good weather to fly to Skardu. Clint and I took advantage of the time to shop for some Balochi rugs, eat some street food, and watch bad CIA adventure movies. We managed to time our arrival in Pakistan with the start of Ramadan, so eating during daylight hours has come to a standstill. Miraculously, Clint’s bag caught up with us this morning and we lucked out with clear weather for the flight to Skardu, elevation 7600 feet. 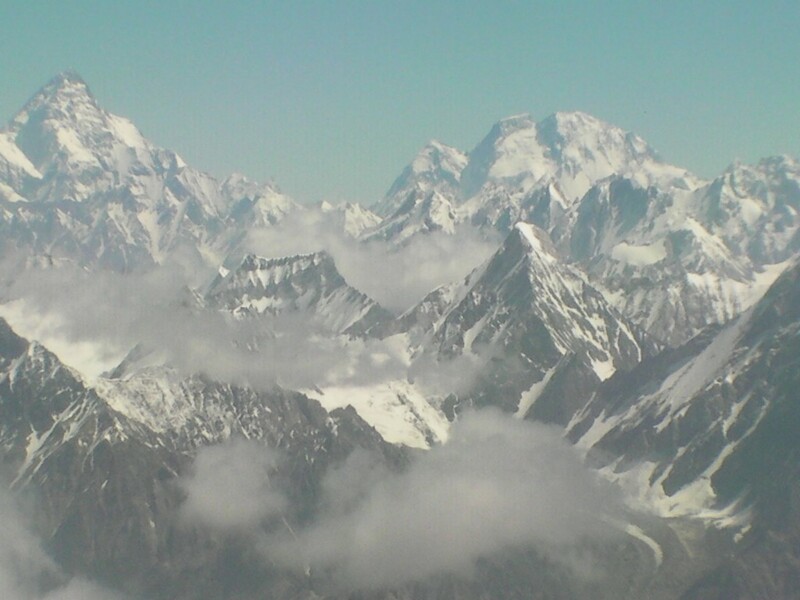 The whole Karakoram Range was laid out in full splendor providing great views of K2, Masherbrum, Gasherbrum, and Nanga Parbat. It was nice to get back in the mountains after several days in the hot humid lowlands. Zafar lent us his Honda 125 motorcycle to blast up to Zampara Lake above town. The wind was blowing a steady 10-12 knots which had me wishing I’d packed a kite and board. my way to Pakistan, meet Matt, had have more grand adventure. Well, I have negotiated the back alleys of another sleepless city. Cairo (pop 20mil) can be intimidating at first. Yet if you summon up the courage to dive into the thick of it, the reward is abundant. Spending time in a city that literally never sleeps provided ample opportunity to tuck into a number of generations old ahwan (coffe shop) and sip a cup(s) of the best coffee I have ever had amongst masses of other Cairenes. The friendly ”salaam a laykum’s” (peace be upon you) definitely make one feel welcome. After coffee one morning I was trying to decipher the cities buss system, en route to the pyramids of Giza, when a kind faced older gentlemen approached me. It must have been obvious I didnt know what I was doing, because he pointedly asked me what I was trying to do. When I told him, he said he lived near Giza and that I could ride the busses with him the whole way. We hopped from one buss to another and finally arrived at our destination. Not only did this gentlemen help me along, but he paid my buss fare! We parted ways with a firm handshake and an exchange of phone numbers with a promise to call. This kindness was refreshing in a city of smog. All of this to get me back to being a tourist. I rented a camel, yes a camel, and spent the next 3 hours riding around the pyramids of Giza, the ancient wonders of the world. They are a wonder. The next day I hopped on a bus for 9 hours through the desert to St. Catherins Monastery, at the base on Mt Saini. Given the bus broke down twice en route which caused substantial delay, we didnt get to our destination till the late hours. I got off the buss and started hiking toward the mountain. Feeling my way through the dark, I find the trailhead, only to be closed and guarded…….nothing a little backsheesh cant handle. 85 egyptian pounds later, Im on my way. I find a nice little cave a few km up the mountain to doze in. At 3am, Im awakened by an ungodly number of pilgrims making their way up this Godly mountain. I pack up and follow suit. From the summit of Saini, I watched a beautiful sunrise amongst the chanting and singing of 200 pilgrims. It was an inspiring and disheartening experience at the same time. Inspiring to see the many elderly men and women make their way up the 6km and 3750 hand laid granite steps to the summit to see this mountain of mosses. Disheartening because of the 2k plus years of refuse and excrement deposited on the slopes from these worshiping masses. I hope we learn to treak ouw mountains better than this. Getting out of saini proves to be more of a challenge than getting in. I met another traveler who wanted to go in the same direction I did, which apparently nobody else ever went. he and I hired a car together to drive us out 70km to the junction where the road went north and south. The driver of the car would not travel any further. So we thumbed a ride in the middle of the desert, each to our separate destinations. Which brings me to where I am now. A place called Dahab. once was. Its still a beautiful beach town on the gulf of aqaba. Yet has turned into what you would expect, overpriced, and overrun with culture ignorant westerners. Matt, It is though the new wind mecca. Pole boarders and kite surfers are in heaven here. The snorkeling has been out of this world! The beautiful beaches look out over the Red Sea to Jordan and Saudi Arabia on the other side. Somewhere over there is the lost city of Petra. Regardless of all the smelly hippies running around in short shorts, drinking alcohol in public, and paying too much for their chinese made ”arab hats”, even during Ramadan, Dahab is still a magnetic and relaxing place. But tomorrow, I will be back on a bus to Cairo, the next day, on a plane. Thats where I am, what Ive been doing. Now Im gonna go get some food. Asalam al lekum to the United States. Mentally preparing for the 48 hours of travel to Pakistan. We are as ready as we can be. . .Clint has been riding camels and running training laps on the pyramids of Egypt this week. . .I wonder if he got any of those Obama dates? I get on the plane at high noon MST and will be arriving in Islamabad Tuesday morning – I hope they have really good Bloody Mary’s on these flights. Big thanks to everyone, especially my wife, for their support on this trip. Talk to you next from the other side of the planet. Clint Estes and I are heading to the Kondus Valley in far northeast Pakistan August 23-September 27 for a humanitarian outreach/ climbing expedition. We received the Zach Martin Breaking Barriers grant from the American Alpine Club. “Two officers of the Ouray Mountain Rescue Team, Matt Hepp and Clint Estes, have scored what they say could shape up to be a once-in-a-lifetime climbing trip to a remote area in north Pakistan. The upcoming expedition involves more than just potential mountaineering tales worthy of the American Alpine Journal. In addition to numerous first-ascent climbing opportunities in a long-closed militarized region, Hepp and Estes will be performing humanitarian work in local villages in the earthquake-riddled mountains of the Great Karakarom range. Once there, they plan to build a simple, earthquake resistant demonstration home to help villagers learn to cope the next time the earth’s crust shakes up their world. Estes, who is in charge of the team’s new rescue facility and owns a contracting business, describes the structures as necessarily simple — sandbags capable of riding out new tremors, capped with a simple metal roof — made from locally available material. In the aftermath of some past earthquakes, Estes said, tents provided the immediate shelter, but that in some cases fires lit for heat and cooking had disastrous, even fatal consequences. Hepp and Estes are following a lead of Jim Nowak’s Ridgway-based dZi Foundation, which once executed a post-earthquake housing project in neighboring Afghanistan. Estes said Nowak counseled them to keep their work simple, because the remoteness and lack of supplies, materials and resources can foil more ambitious efforts. The pair hopes that village governments will offer some financial support for materials, so as to become invested in the project. To that financial end, the climbers this May landed a small, $1,500 award from American Alpine Club. They received the club’s Zack Martin Breaking Barriers Grant, and equipment sponsorship from AAC industry partner Black Diamond. Other companies chipping in include Mountain Hardward, Evolve, Julbo, GoLite, and Brunton. Hepp and Estes are holding a private slide show next week where they will be selling t-shirts in support of the trip, and said they wouldn’t turn down donations to support the housing project. Info: clintestes@hotmail.com or matthepp@ridgway.us. 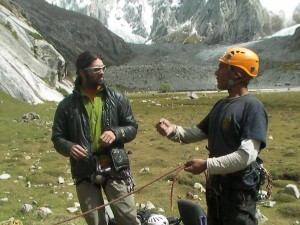 “We got really lucky,” said Estes, referring to landing a rare climbing permit from the Pakistani government to enter and climb in the remote Kondus Valley, near borders of which have been in dispute with India for decades. The permit is the third ever issued in the region, the only other permission granted in 2000. Hepp and Estes will be accompanied throughout their travels by a liason officer named Zafar Iqbal, who they said has been extremely helpful in setting up trip logistics. The Ouray team will fly into Islamabad on Aug. 25, then drive by Jeep with Iqbal for about 12 hours to the main town in the valley, Khaplu. They’ve budgeted about three of their five weeks in Pakistan as a climbing window. The objective: little or never-climbed 6,500 meter granite slabs. That’s better than 21,000 feet, a Sneffels and a half. 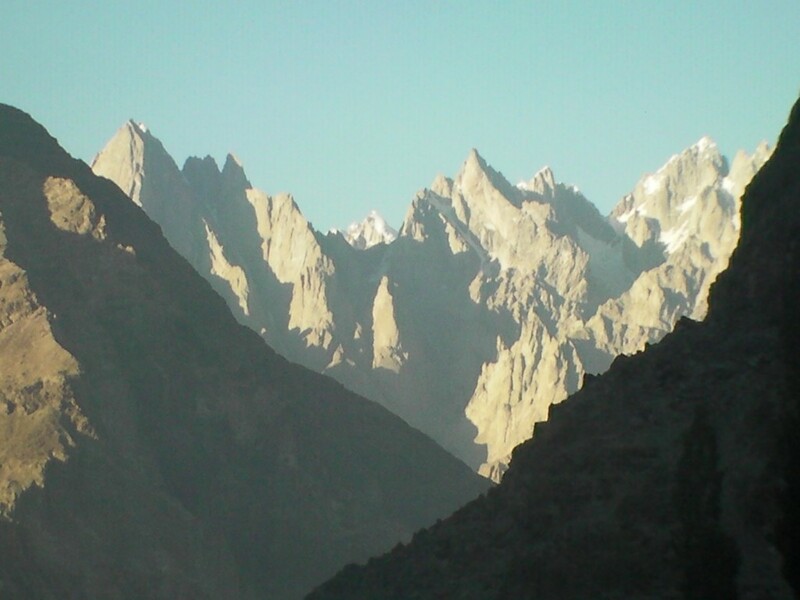 “According to rumors and a few tantalizing photographs of the region, there appears to a lot of low-hanging fruit in the form of unclimbed granite spires, some of which are even visible on Google Earth,” said Hepp. “It’s a shangri-la of giant granite towers,” adds Estes. 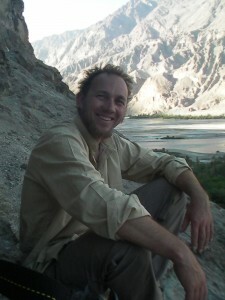 Hepp has ventured to Nepal twice before, and Estes has been the Himalayas once previously. We have raised over $1500 in donations from friends and supporters in Ouray County and beyond. These funds will go toward the purchase of post-earthquake hasty shelter materials for the villages of Korkondus, Karmading, Lachat, and Chogogrong. The bags are packed, visas and special permits are in hand. Clint leaves for Cairo (Mt. Sanai acclimatization) in a few days and I leave the country August 23. 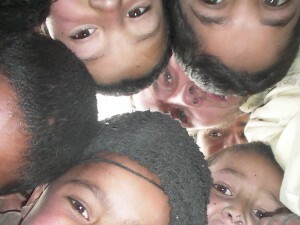 I’ve spoken with several other expeditions that have recently returned from Pakistan. They report having a great time, even though Pakistan is in the middle of conflicts wiht the Taliban on the west side of the country.